You may be wondering why we chose Estonia for this blog. We don’t receive too many academic documents from Estonia for evaluation and have not had the opportunity to visit this country, at least not yet! But when we asked one of our staff to pick a country, he chose Estonia. So, here are some non-evaluation related facts you may enjoy about this country in northeastern Europe. We’re reposting our post on Estonia from 2012 with a few updates. Enjoy! Let’s get started with “tere” which means Hello in Estonian! 1. While the official capital of Estonia is Tallinn, the country is unique because it has more than one recognized capital. In fact, it has several capitals that change throughout the year. Tartu is established as the “cultural capital of Estonia”, while Parnu is known as the “summer capital”. 2. Estonia was the first country in the world to use online political voting. 4. Estonian is the official language. Russian is also widely spoken. 5. The Estonian currency was the Kroon, but they have joined the Euro-zone and Euro is their official currency now. 6. Even though Estonia is considered to be a part of the Baltic countries; Latvia and Lithuania, there is no real political alliance. 7. Estonia is named after the “Ests” who inhabited the region in the first Century AD. 8. Estonia is the least religious country in the world with only 14% of the population claiming any religious beliefs. 9. Almost 50% of Estonia is covered by forest. 10. Estonia has a population of 1.3 million and one of the most sparsely populated countries in Europe. 11. Estonia has the highest number of meteorite craters per land area in the world. 12. Estonia is the homeland of Skype, Hotmail and KaZaA. 13. All Estonian schools are connected to the Internet. 14. Chess Grandmaster Paul Keres was born in Estonia. When he died in 1975, over 100,000 people attended his funeral (10% of the country’s entire population). 15. Out of the nearly 200 countries in the world, Estonia ranks in the second place with a literacy rate of 99.8%. 16. In 1994, Estonia became the first country to institute the flat income tax. 17. They have the biggest collection of folk songs in the world with written records of 133,000 folk songs. 18. The Estonians invented Kiiking, which is considered a sport. It involves fastening yourself to an enormous standing steal swing (kiik means swing in Estonian) which has a full 360 degrees of rotation to it. To swing a kiiker the contestant must pump by squatting and standing up on the swing. The swing gains momentum taking the person in full circle by his skillful pumping. 19. Estonia produces quality vodka and boasts Viru Valge and Saaremaa as its most popular brands. 20. Estonia is the only Baltic country with far-reaching and deep-rooted island culture. Estonian islands tend t be rural, most uninhabited, with traces of local Viking and medieval culture. For further information on the world education systems and credential evaluations, visit our website at www.acei-global.org or contact ACEI at acei@acei-global.org. I believe, that “I vacationed in”, “took a trip to”, or “summered abroad” really becomes “I lived in” the minute you need a job. It could be three years or three weeks, but at that point, as many young adventurers figure out, the vacation ends with the patronage or savings. A punch to the gut at first, realizing “oh, I have to eat next week” can wipe away the whimsy quickly. Many will never experience this. Short trips and healthy bank accounts are a shield against this kind of exposure to the daily life of a local. While it is easy to envy those with the funds to jet set without care, they too have something to envy. There is no appreciate, no immersion quite like a job. It is where many of us learned to socialize with other adults, and the same goes for a different country. You may proudly renounce your status of “tourist” and make friends that have a chance of lasting beyond the week. You become a part of the economy and community and it is a feeling so unlike that of a visitor. Beyond that, like any job, there’s the opportunity for memories and stories beyond what monuments you have seen. Anyway, one of my responsibilities was to collect payment from all the parents for the program, about 500 Euro each for 8 weeks of lessons. At the end of that particularly exhausting class (40+ primary school aged children, enough said), after waiting an hour for this child’s parents who were running late, I left in a hurry to get home. About halfway, feet away from my apartment, I realized I left my backpack at the school lunch tables right in the entrance of the school. About 15k Euro in checks and cash. Obviously doomed, I turned around and ran back not out of hope but rather, desperation and panic. Fired for sure, maybe not responsible for the checks but for sure the third in paper money. You know, doomed. I flashed through the entrance and saw my backpack on the table, wide open. Again, doomed. I go over just to grab the bag. Inside I found every last check and dollar to the cent. Missing, though, was every lollipop I had. Like 4 bags worth. I have never been happier with this world than when those kids chose 2 Euros in lollipops over maybe 5k in cash alone. Not dumb. Just, what do I want? Someone else’s money? or ROOT BEER LOLLIPOPS. Perhaps this would have happened anywhere I had been in the world. Maybe it isn’t specific to my time in Ireland. But even then, how reassuring to know that kids are kids, wherever you go. Because of that, the experience, the thought, the memory, I am so thankful for being broke in a foreign land. We recently heard a report on CNN about foreign medical doctors who are unable to practice in the U.S. and are driving taxis instead. We frequently hear about the plight of legal immigrants in the U.S. who find themselves with little or no information on whether their education from their country of origin is worth anything in their new adopted country. Many simply assume they have to start from the beginning, take the GED, enroll in a college, or apply for and accept employment in jobs below their level of education attainment. Many are not aware that they can have their academic credentials evaluated to receive the approximate U.S. educational equivalence to help them with qualifying for employment, a professional license or admission to a U.S. college/university. Foreign credential evaluation is a process where academic credentials earned in an institution outside the U.S. is verified and converted into the U.S. educational equivalent. Foreign credential evaluation service providers are typically private for-profit or not-for-profit organizations. Some state licensing boards, U.S. colleges and universities and professional associations also prepare evaluations of foreign credentials for their candidates. A foreign credential evaluation provides the approximate U.S. educational equivalence of studies completed at an institution outside the U.S.
A foreign credential evaluation does not guarantee that a level of education completed in a foreign educational system results in the same educational outcome. For example, if an individual completed three years of studies at a university outside the U.S., the U.S. educational equivalence for the studies may or may not be deemed comparable to a degree. A foreign credential evaluation does not guarantee employment but it will provide the employer with confirmation whether the candidate has met the educational requirements for the position. A foreign credential evaluation does not imply that the individual is qualified to practice his/her profession. In order to practice a profession such as medicine, nursing, engineering, dentistry, architecture, etc., candidates who have had their foreign credentials evaluated must also sit for the licensing examinations as required by the State in which they intend to practice. However, the evaluation will provide the professional licensing board the information it needs to determine the candidate’s eligibility for licensure. A foreign credential evaluation does not guarantee automatic admission to a U.S. school/college/university or transfer of credit, as each institution has its own specific admissions and placement policies. It will, however, inform the institution as to the level of studies completed in order to determine eligibility for admission. A foreign credential evaluation does provide the individual an understanding of his/her education’s comparability to the U.S. system so that he/she can pursue their studies or seek employment in a field in the U.S. that is compatible with their education. A foreign credential evaluation is similar to currency exchange, where the education completed in one system is converted to the education system of another. So, before an immigrant dismisses the studies they completed in their country of origin, having their academic credentials evaluated will be the first step to take as they begin this chapter of their life in a their new adopted country. The U.S. Department of Education, and the U.S. Department of State, provide links to organizations that provide foreign credential evaluation services in the U.S. The NAFSA: Association of International Educators also provides guidelines on how to select a foreign credential evaluation service provider. Parents across the country are scrambling from store to store scooping up supplies. Kids and teens are starting to wake up early again. Administrators and teachers are putting final touches on new curriculum and classrooms. The new school year has begun and everyone involved is getting ready. In the flurry of preparations, let’s pause to remember the inner resources we all really need to thrive and flourish this year. What can we, as parents, teachers and caregivers, provide to equip our loved ones with skills they need to navigate the upcoming stress of the new school year? Here are few simple, easy to implement ideas to start the school year on a positive, mindful note. Imagine having to change jobs or bosses every single year! Essentially, that’s what many children and teens do throughout their school experience. We tend to brush past this yearly change because it is normal. Normal or not, it isn’t easy for some kids and can be a major source of hidden stress. Acknowledging the challenge and offering a listening ear can help alleviate some of the anxiety kids may have about meeting the new year. Carving out a little time within the hustle of preparations lets your child know that their feelings matter as much (more) than the pencils, paper and schedules. Take a walk, grab an ice cream cone, have a cup of tea or plan whatever simple activity your young person enjoys with the intention of letting them know, once again, that you are there, you understand and you are always willing to listen. whenever they need you. Even if they don’t open up in that moment, you are showing that the door is open for future connection. Modeling generosity and including your child in generous actions helps to remind them of its’ value. We can be generous with our time, money, energy and spirit. Sometimes our own to-do lists are so long that it seems we don’t have time to be generous to others. Yet, generous actions can energize everyone involved, making it easier in the long run to accomplish all of the mundane tasks on our lists. Offering to help another family get supplies together or an action as simple purchasing an extra pack of pencils for the classroom weaves a sense of caring and community into the yearly school prep activities. An easy way to model kindness is to send your child to school with a short note or card for their teachers. Let your child read the note wishing their teachers a great new year full of connection and discovery. 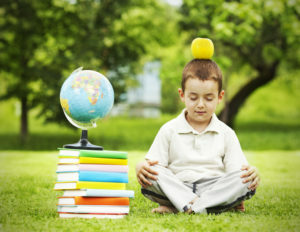 Express gratitude to the teacher for caring for your child each day. The kindness and gratitude is sure to brighten the teachers morning and could help your child grow a positive relationship with their teacher, as well. Most importantly, your child is part of an act of kindness that can easily be replicated autonomously in the future. When sticky situations crop up later in the year, and you hear that a classmate is having trouble, you can prompt your child to offer a kind note.